Discussion in 'The Lounge' started by I Are Baboon, Aug 31, 2005. I love this toy. I bought it a few months ago. It's great to have when I am walking the dog at 5:00 AM (our street has no lights). This thing is so damn bright I could probably use it for night riding...well, the 1.5 hour battery life (AA's) isn't too good. Yeah, I know...pretty pointless/useless thread here. I like to wear them around my waist underneath my pants, go to bars and tell cute girls to look into the light. 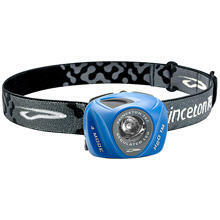 i picked one up last summer at MEC in Vancouver; a Petzl something-or-other. that thing is badass. one of my better $30 purchases. You're that lady from Poltergeist, aren't you? "Go into the liiiight... allllll are welcome, allllll are welcome....."
I need a new headlamp. I'm still using my old Petzel that has the giant battery pack on the back of the strap. Agreed! The LED headlamps rule. Camping, night hikeing, even working on a bike in the semi dark. I carry one in my camel back just in case when ever I am on a night ride or evening ride. I learned my lesson on "Black Friday" in New Zealand. Sorry "All" are not welcome, invitations only. Not yet. Nothing seems to work, I just keep trying different things. I'll let you know when I find a winner.